Whilst on holiday in Malta early in March last year my nephew suggested that we pay a visit to a friend of his, woodcarver Ray Azzopardi. I thought this would be a good idea as it would give me time to talk to my nephew on the way. He works shifts at a hospital and is very busy. I wanted to pick his brain regarding his hobby, ceramic sculpture. I said I would go provided that he was the one behind the wheel as driving along the congested roads during the Maltese rush hour can be very nerve-racking. Shaking like a leaf I tottered out of the car when we finally arrived at Ray's place. I had spent the whole journey with one eye closed, the other a slit, as I clutched the dashboard and braced my whole body as if I was braking all the time. Not that we were going too fast, which in fact we were, but the close proximity of innumerable other cars all in contention for postage-stamp size spaces had me terrified. It felt like a real life dodgems situation. Naturally, we never got round to discussing ceramics. Ray had been waiting for us. "Aha, you made it then," was his greeting. I walked around for a bit pretending cramp although my real motive was to get the blood flowing again through my plasma-starved legs. He took us first to a garage built beneath a house, switched on the lights and immediately we found ourselves in the midst of a collection of life-sized wooden sculptures. "These are for my next exhibition," he told us. I was enthralled. What did I expect, a collection of miniature statuettes? I ran my hand over the carvings. The first thing that struck me was the size of the chisel cuts which were not the tentative, hesitant strokes I was used to, but the bold, sure, precise cuts of a master craftsman. On asking him where he got his inspiration from, he responded with "the wood suggests it". He went on to tell us how he is always on the lookout for boles of trees on building sites, whatever is available: olive, sycamore, walnut, pine. His usual method of work was to stand the wood on a movable trolley (a homemade device), anchor the contraption down with weights, look at the wood, and then wait for an idea to suggest itself. After sketching a few ideas down on paper, or even on the wall, he starts work on the carving. As he works, the intended finished result begins to take shape, and he goes on to refine the message he means to convey. Often this takes the form of a single word, and titles I spotted included Liberation, Anxiety, Freedom and Protection. He writes the word down in charcoal on the wall and meditates on its meaning, implications, and how it manifests itself. I asked him whether or not he seasoned his sculptures. "No," was his reply. 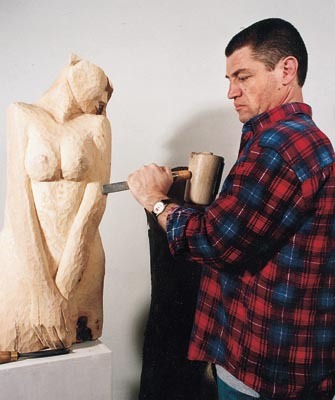 "I work any shakes into the sculpture. These shakes rarely occur in the body mass. Sometimes the sap in the wood spurts into my face. I work oil into the wood." 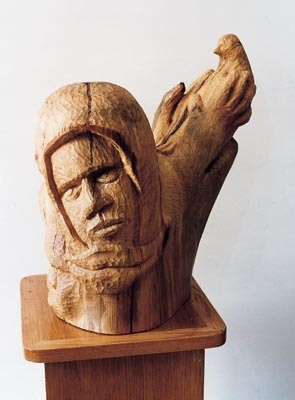 During our conversations it emerged that Ray is entirely self-taught as a woodcarver. "I started out painting in acrylics", he told me, "but I didnâ€™t get the satisfaction or the expression that I wanted. 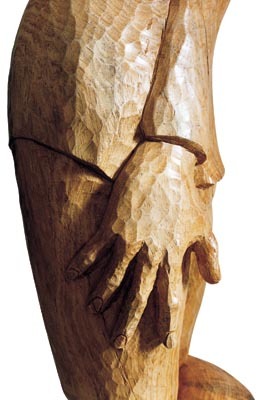 When I tried carving wood I knew that this was my medium." He went on to show us some of the new ideas he had tried. There was a plaque, some 75mm (3in) in diameter, which I was told represented the sun rising. It had been burned with a blow lamp to blacken the pith, then sanded down and sealed with several coats of matt varnish. The result was very effective. The sheets of plywood had been glued together and then shaped. The contrasting colours of the laminations enhanced the finished object. My favourite sculpture though, was that of a torso of a man holding aloft four doves, all of which were flying off in different directions. If I'd had the money and the means of transporting the carving I would have bought it there and then. He had titled the sculpture Liberation and then went on to wax lyrical about how the spirit of man is always seeking release from its shackles to attain freedom. Another statue of a man enfolding a child in his arms, caught my eye. This one was called Protection. 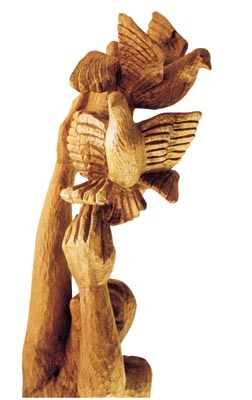 Natural instincts are a rich source of inspiration in the hands of a poetic craftsman. He then took us to another garage a short distance away. Situated under his house this was his own workshop. I was amazed at the meagre nature of his tool collection which consisted of little more than a chainsaw, an electric rotary polisher, grinders and an array of well-used chisels. "I improvise a lot", he told me, backing this up with "I can't afford all the tools I would like to have." Upstairs, in his house, to one side of the main corridor from which led various rooms, he had a whole row of finished pieces, mostly his first attempts at woodcarving, and you could see from them how his art, modern and meaningful, had evolved. We thanked him and wished him success in his hobby for the future. I felt inspired and vowed that on returning home I'd let my imagination govern my chisel and mallet. Perhaps I could attempt again the flamenco dancer finishing her routine with the haughtiness, flair and movement I'd been planning to incorporate. I'd decided to call it Ole!